My friends, I don't mind telling you that we find ourselves in a culture war. The forces of radical atheism again threaten to rob this great country of the symbols of it's freedom and it's proud Christian heritage. If these people have their way all traces of Halloween's Christian roots would be erased and all references to Jesus would be stricken from Halloween parades, store displays, and the hopeful mouths of trick or treating Christian children. We must all stand together against this atheistic tyranny. One of the stories, atheists don't want you to know is the story of the Jack O'Lantern. In Ireland, Christians were persecuted for many centuries. One of the reasons that St. Patrick was celebrated for driving the snakes from Ireland is because they used to feed Christian children to the snakes. Christians were kept poor and not allowed to hold jobs. Their possessions were simple, but their faith was mighty. As the Irish traveled along the countryside at autumn harvest time looking for work picking crops, they were frequently met with signs that said Christians need not apply. Even a non-Christian who hired a Christian to pick his crops faced persecution from the Irish King. The Irish needed a subtle symbol to let others know that they welcomed Christians and that the light of Jesus shined within them. They came up with the idea of taking a pumpkin and carving a smiling face on it. They then placed a candle inside the pumpkin and placed it in the window. 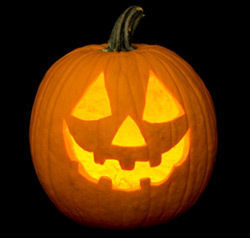 The Irish named this pumpkin Jack of the Light or the Americanized version, "Jack O' Lantern". Nowadays, pumpkins are carved into the most grotesque and hideous shapes imaginable and the original meaning of the Jack O'Lantern has been lost. This Halloween if you carve a pumpkin with your children I hope you'll tell them the story of how the Jack O'Lantern saved Christianity in Ireland--one of the most Christian nations in the world today.